Surrey is a big city and it's only getting bigger. Just like in any big city, it's hard to keep track of all the incredible things that are going on, and even harder to figure out which ones to make time for. From parks to parties, restaurants to the outdoors, below you'll find the top 5 things to go, see, do, or all the above, in Surrey. Family run since 1975, the Old Surrey Restaurant is the epitome of local heritage. The ingredients on your plate come directly from the family's own farm in Chilliwack, BC. The multi-generational dedication to excellence is reason enough to put a visit here at the top of your priority list. There's a reason OpenTable put Old Surrey Restaurant in the Top 50 Romantic Restaurants in Canada. If you're especially outdoorsy, you can find a slice of heaven in Green Timbers Urban Forest. With over 10km of hiking trails, year-round fishing, and a carefully protected thriving ecosystem, this forest is a green jewel in an ever expanding city. 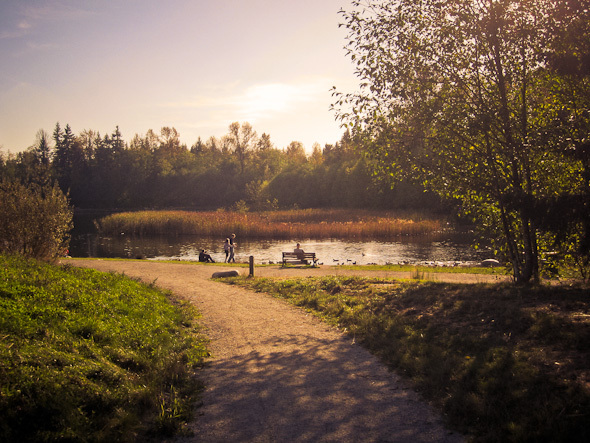 The park is also home to the Surrey Nature Centre, which hosts lots of free drop-in activities, including nature walks and fishing rod loans! Not the outdoors type? Guildford Town Centre has got you covered. Since a $280-million renovation in 2013, this shopping centre has become one of the hottest spots to shop in Metro Vancouver. Easily accessible by transit, GTC boasts over 250 stores including Forever 21, H&M, Nike, Apple, and most recently, Uniqlo. Crescent Beach is a quiet oasis nestled in the South Western corner of Surrey. Go for a picnic, a swim, or a walk along the shore. The restaurants here offer unobstructed views of the ocean, and Blackie Spit Park on the beach is a fantastic place to take your dogs. There's something for everyone here, making it the perfect place to spend your day. This is it - this is the event of the summer. Located in Holland Park on July 6th and 7th, right in the heart of the city is the biggest musical festival in Metro Vancouver. Open to 40,000 guests, the festival is on its 4th year - and each year is bigger than the last. The 2018 lineup boasts the titanic headline of Future and Kygo, with incredible secondary performances from Kaskade, Kehlani, Brockhampton, Grandtheft, Trippie Redd, and plenty more. Tickets are available now!